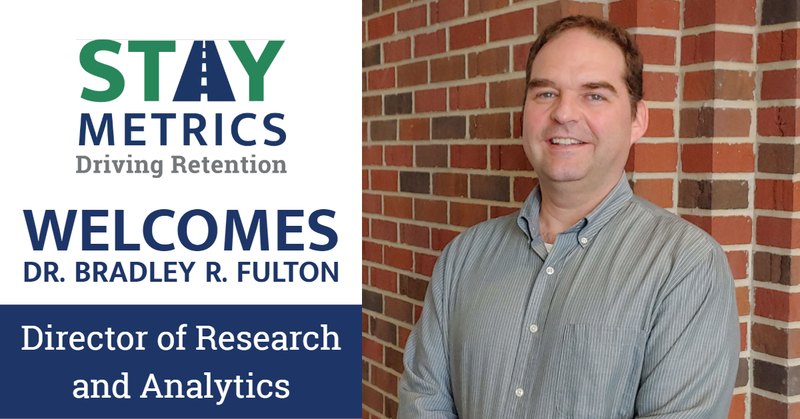 Stay Metrics, the leading provider of driver retention tools for motor carriers, today announces the appointment of Bradley Fulton as Director of Research and Analytics, with responsibilities to lead the company’s survey products and research team. A core value of Stay Metrics is “never quit getting better,” and with the new position and team member, the company is further enhancing its ability to deliver greater insights and recommendations to motor carriers using its suite of driver survey and feedback products. Fulton holds a Ph.D. in Applied Social Psychology from Loyola University Chicago and is an expert in statistics and research methodology. He also brings a wealth of relevant work experience in survey design, analytics, training and consulting with business clients. For more than 10 years, Dr. Fulton has worked at a leading healthcare feedback and analytics company known for developing and distributing the most widely used patient satisfaction survey in the United States. Stay Metrics has a suite of driver survey products that gather feedback at several points during the onboarding experience. The surveys measure the incoming expectations of drivers and subsequently how they are being met by carriers. Stay Metrics also offers an in-depth annual driver survey that measures the satisfaction levels of drivers for a wide range of factors known to cause turnover and increase retention success. Additionally, the company offers an exit survey program that rounds out the driver feedback lifecycle. The addition of Dr. Bradley Fulton, a widely published author of articles in respected business and academic journals, will also benefit the entire transportation industry by expanding the ability of Stay Metrics to publish and share research.